Ruger has partnered with Lipsey’s to offer three new single-action revolvers chambered for .327 Federal Magnum. An underdog of a cartridge, .327 Magnum is a hard-hitting cartridge in a small package. Called the Single Seven, the new revolvers are offered in three models with user’s choice of a 4.6-, 5.5 or 7.5-inch barrel. Patterned off their Single Six, the Single Sevens have, as the name implies, a seven-shot capacity. 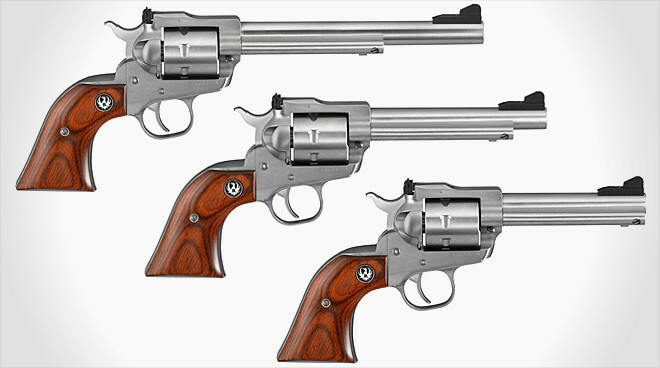 The new Single Seven series is built on stainless steel frames with hardwood grips that include Ruger’s silver medallion. They have serrated, ramped front sights and adjustable rear sights that can be tweaked for specific loads and individual shooters. Chambered for .327 Federal Magnum, the Single Seven is an extremely versatile family of revolvers. In addition to .327 Mag, these revolvers can shoot .32 H&R Magnum, .32 S&W Long and .32 ACP, opening the door to a wide spread of loads and power levels to choose from. Unlike most .32-caliber cartridges, .327 Magnum is no slouch in the energy department, more than capable of generating over 500 foot-pounds of force at the muzzle with these handguns. Putting things into perspective, .327 Federal Magnum meets or exceeds common semi-auto cartridges and even catches up to some light .357 Magnum loads, with a much smaller, faster bullet. So not only is the Single Seven series flexible when it comes to ammo, it’s flexible when it comes to usage. Even though the single-action revolver is a bit dated when it comes to platforms, chambered for .327 Magnum it can handle just about any task, from plinking to hunting and while not ideal for it, more than adequate for self-defense. With it’s MSRP of just $659, it’s also affordable for many shooters, especially with street prices in the $550 range. Ultimately the Single Seven series will be a hit with the scrappy bunch of .327 fans who are looking for something a little different. Ruger and other revolver manufacturers have tried to make the .327 Magnum cartridge come alive and it will never completely fade away. Hopefully, with the help of Lipsey’s, .327 Federal Magnum will get another chance to see more widespread success. One thing’s for sure, and that is if you’re thinking about getting a Single Seven, you’d better hurry. They may not last long and this could be your first and last chance to pick up a new, single-action .327 Magnum by Ruger. Still, this could also be a sign of a resurgence for the cartridge. If demand is high enough, Ruger may be tempted to bring back their GP-100 and SP-101 models chambered for .327 Magnum. More information, including details and specifications, can be found at Lipsey’s and Ruger.